We Laughed, I Cried, He Drove. It’s a funny thing sometimes, how one handles watching a second child reach important life milestones after already watching the oldest child reach them. In some cases, and for some people, it’s easy to make light of the accomplishment, or not document it as much as the first time. I try my best not to be that parent. My younger child deserves just as much attention and kudos for his accomplishments as my older child does, and it’s not only an important part of his general emotional development that I do my best in this area, but also an important part of our relationship. 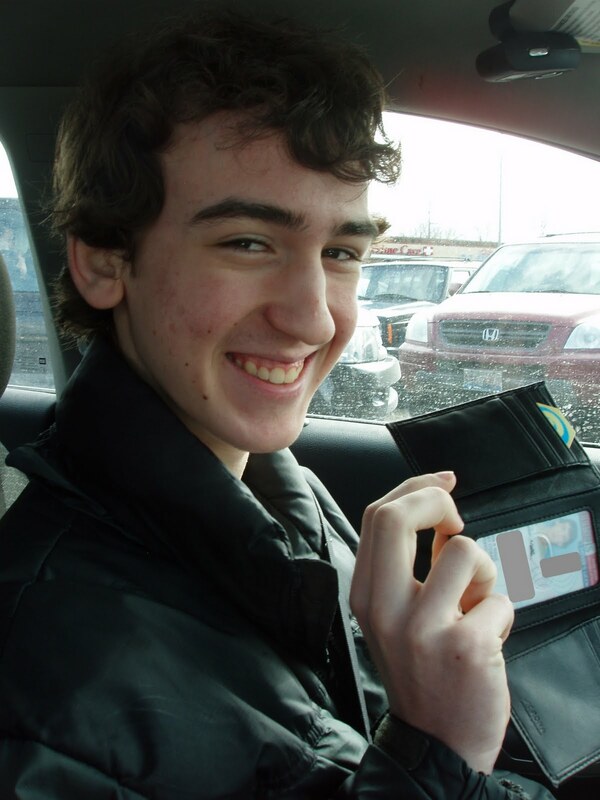 So, I was ready to fully celebrate, with much fanfare, the acquisition of J’s driver’s license. On Friday, we headed to the DMV with all of the required paperwork, and my camera. We stopped at the first counter, where the friendly woman there told us that, due to his achieving a perfect score on the road test he took as a part of his driver’s education class at school, he would not need to repeat the road test for the DMV, unless his birthday came up in the random selection of people to be tested. It didn’t. The woman laughed and J shushed me, figuring that if I made that much of a stink about it, they might change their minds. I felt cheated, not because I thought he needed the road test (he’s an excellent driver! ), but I wanted the pictures. It was actually quite funny, and we got a good laugh out of my irritation. Or maybe that was just me. We moved on to the next station, where a man typed all of J’s information into the computer as he expressed congratulations for his perfect road test score and final grade of “A” in class, and then sent us over to the cashier. When his name was called, he strode over to the camera and sat down in the designated chair. I got my camera ready…and then a little old man placed himself right in between me and J, making it impossible to get the shot before J got up and walked back over to me. J thought this was hilarious. It wasn’t too long before his name was called. I quickly got my camera ready, and when he took his license from the photographer, he walked back towards me slowly, grinning from ear to ear as he inspected it. I snapped two pictures. Both of them were blurry. As I declared the morning to be a total loss, picture-wise, J laughed at me and asked if he could go out by himself and run an errand after dropping me off at home, just like D did when it was his turn. He was thrilled, and was then open to a mini photo session when we got into the car. 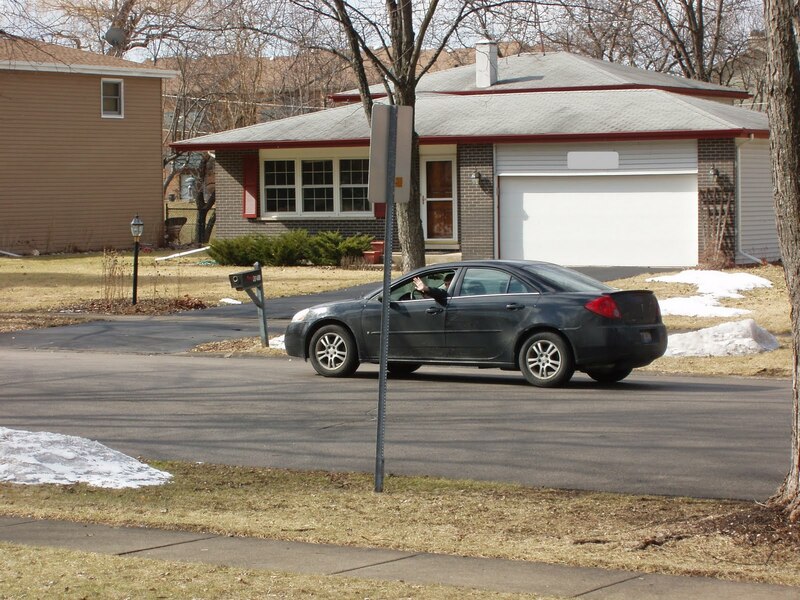 When we arrived at home, I instructed him to wait for me to get my camera out before he drove off, so I could at least capture this moment for posterity. And to be careful driving. As he backed out of our driveway, excited about his newfound freedom, I watched him and in that instant, though the morning had been completely different in every way from when D got his license almost three years ago, I suddenly felt exactly the same as I did back then, and got a little misty. Watching a child drive away alone for the first time is a bittersweet thing that grabs your heartstrings and pulls tightly, because it brings to life the reality that he will indeed leave home for good someday, and even though that’s what’s supposed to happen, the idea, when first presented in living color, is like a splash of cold water on your face. Congrats to J. That huge smile says it all. Congrats!!! I think maybe we should move to Illinois, before June 15th when my oldest is scheduled for her road test 🙁 Also, I may puke (at road test, not on Illinois) oy vey! I am just beginning this journey with my son. He started out hesitant of driving, but now asks if he can drive each time we go somewhere. It makes me misty just thinking of him driving away on his own! I'm so happy for J congrats to him. They do grow up all to soon. Give him an extra hug and kiss for me. I've been following this tale for a while but I needed to stop by and say congrats. I know you are proud and probably scared. But being able to opt out of the road test is awesome. Good for him. I know how you feel. HUGS darlin'. Awwww. That is SO AWESOME. Congrats to J on his license! And big hugs to you Mama! Mainly cause you could hardly get ANY PICS! BOO! hahahaha. Congrats! What an exciting milestone. I'm very jealous they still offer driver's ed in Illinois. Sadly, that's not the case where we live. I can't help but think Rebekah would have her license by now if it was still offered in school, but it's been gone a good 10 years or so. It's official. My children will never drive. Previous post: It May Not Be Spelled "Q-pon", But That’s How I Say It.